Halloween is one of the most anticipated days the year falling on the 31st October and celebrated in countries across the word including Great Britain and America. Here at Character Fancy Dress, we aim to make your night extra special and spooky with an unrivalled selection of Halloween Costumes for every age. Halloween captures the imagination and with so many new movies to inspire Halloween Fancy Dress, the quality, originality and range of costumes improves each year. For one of the most exciting nights of the annual calendar, Halloween provides the perfect opportunity to don your most scary Fancy Dress outfit and join in with the celebrations whether trick or treating or attending a Halloween party. 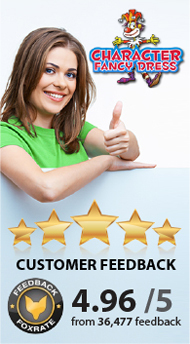 If you are looking for awesome Halloween Fancy Dress ideas for men, women, couples or kids, Character Fancy Dress is the place to come. 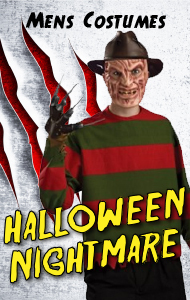 We stock a broad range of Adult Halloween Costumes and Kids Halloween Costumes that includes Vampires, Zombies, and Werewolves to Movie horror legends such as Freddie Kruger. Cause a real fright this Halloween!